*Please note that this page is a work in progress. Exact interactions and layout will be solidified at the end of the research phase. It’s the 1970s, and you’ve made your big break writing for a TV sitcom. Congratulations. Looking back, you know it wasn’t an easy journey getting there, but you broke through the system and landed yourself this gig. However, every day in that world, you’re the only woman in the room. Which means you’re also the elephant in the room. Being both the only woman and the elephant in the room is not an easy tusk task, but you’re good at what you do and know that you deserve to be there just like every one else writing comedy. Through triumph and perseverance you’ll succeed and leave a lasting impression in the world of comedy, blazing a path for women after you. The journey is far from over, even over 40 years later. But with that same perseverance and ingenuity, you’ll never lose hope that female comedians are gonna make it after all. The decade of the 1970s was a pivotal point in the history of women and comedy, a moment when the roles of female comedians converged – they were now not only performing their content, but creating it as well. The Writers World exhibit will tell this story by placing the visitor directly into this moment along the journey of female comedians. 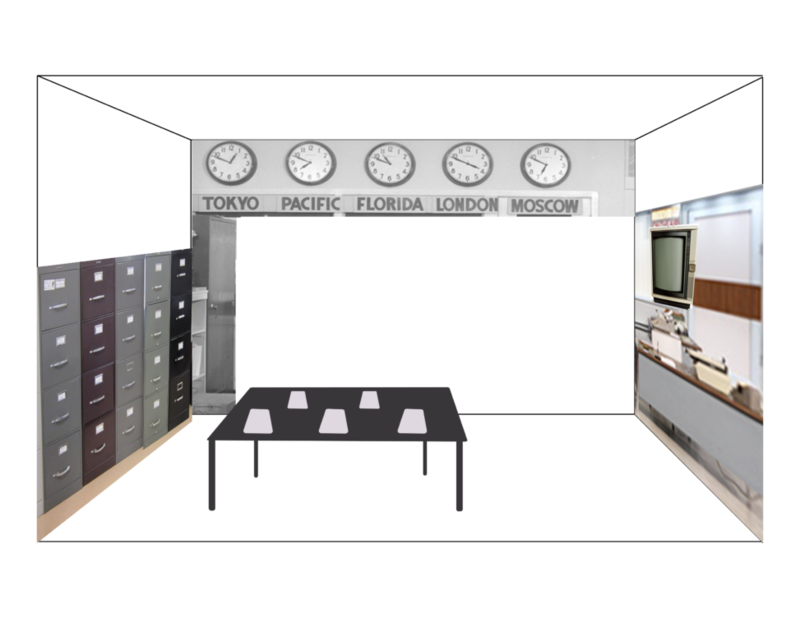 Visitors will be placed in a scene from the 70s, where they will have the chance to experience the stories of the ladies who pioneered comedy writing and interact with the space and content. I want the audience to leave enlightened about the challenges and struggles women in comedy have faced, but also understanding the impact of the efforts made by funny women that helped develop history of laughter that we all enjoy today. This is a very powerful moment in this history that really made an impact on women in comedy and the entertainment world. Through this museum-ette, I hope to share the importance of this slice of history. These are the current design plans, story lines and possibly interactions that I am considering including in this mini exhibit. The content and story are currently based on the preliminary research. This will change based on the research over the next few weeks, but this should act the the shell to build off of. Final interactions will be selected at the end of the research phase. I want the museum to a themed space that people can walk into and experience the content. I also want it to be compact, concise and fulfilling. 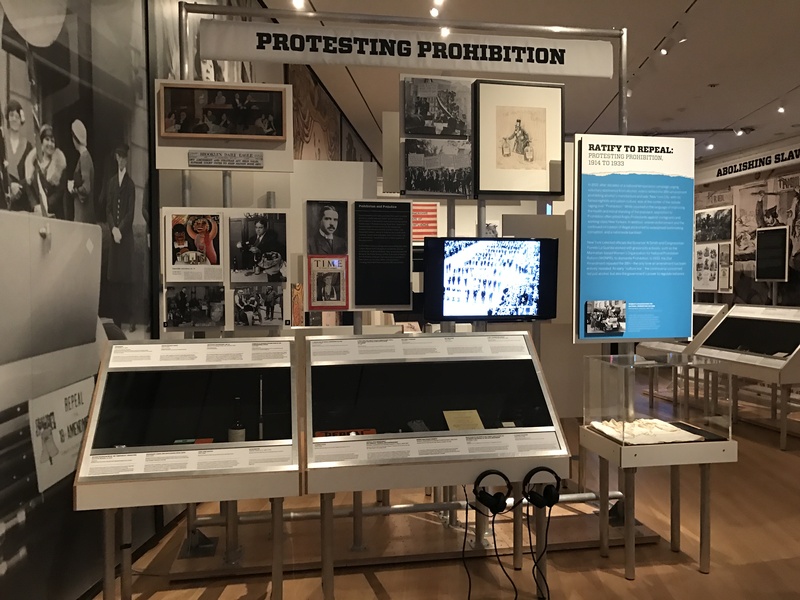 This exhibit within an exhibit at the Museum of the City of New York accomplishes the the size and content issue, clearly getting the message of the content across in an ideal space with interactivity. 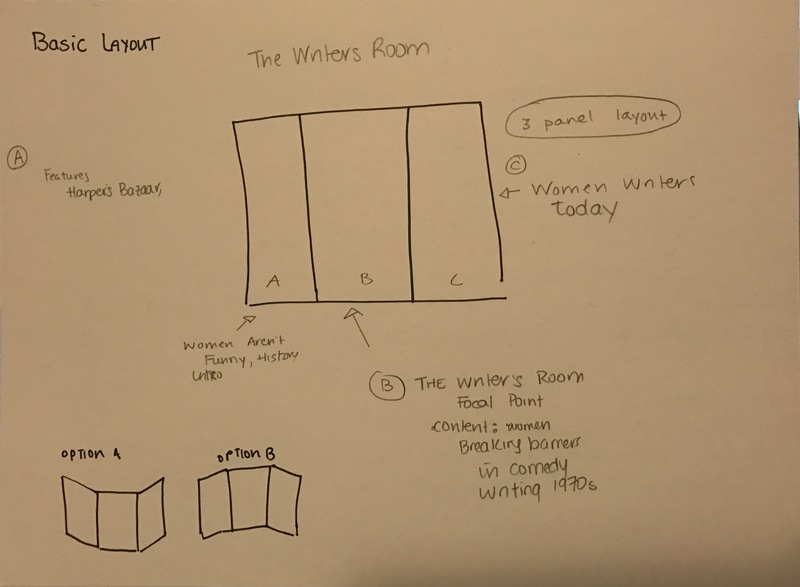 For this exhibit I am considering a tri-fold wall layout, with the center panel being the largest, about 2-3 feet in width and 6-8 feet in height. (Approximately). The side panels will not be as wide, leading the visitors eyes to the center focal point. 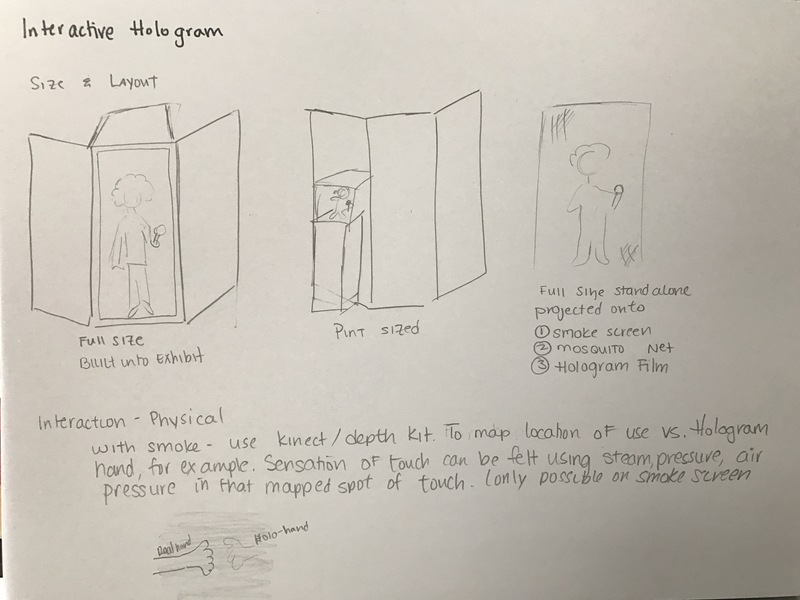 Tech ideas for these interactions are hashed out below but those are just ideas and will continue to be developed over the research period of the project. 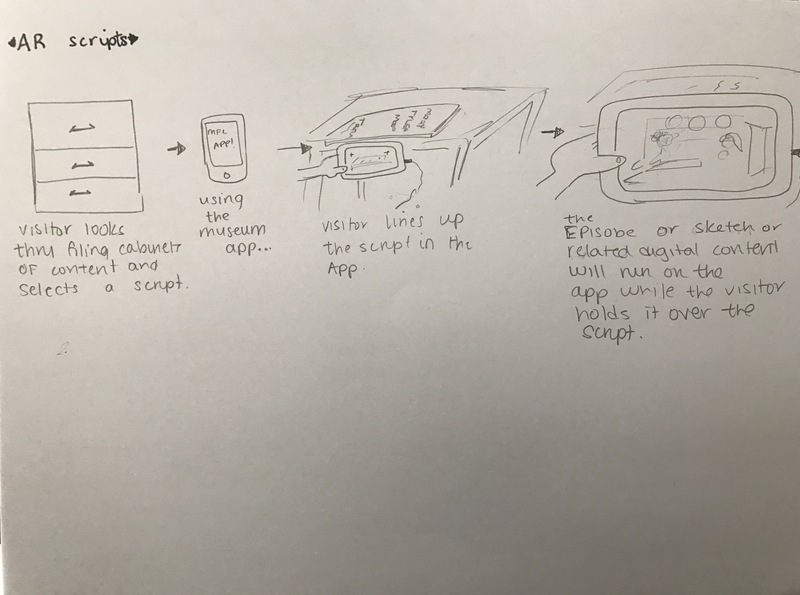 Interaction 1-Script AR: This interaction will allow the visitors to search through scripts written by these women and through and a mobile AR experience they can view clips of the shows above the script. Alternate Version: Visitors search through the scripts and the mobile AR experience will feature an image of that writer and a quote or blurb about their experience on that particular script. Alternate Version: Visitors can select scripts and read them (No AR). 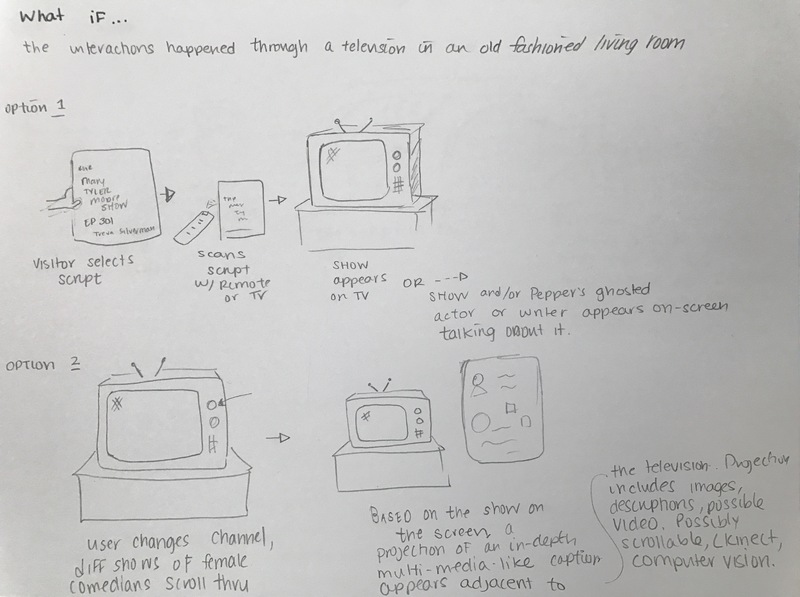 Interaction 2 – TV: Visitors can step up to an old television and each channel will feature the story of a different female writer. This will include possible interview clips, content clips and quotes. This interaction is to showcase the journey of these comedy writers. Alternate Version: Clips of shows written by women, each station featuring a different woman’s story OR each station featuring a different show, with clips of episodes written by the different writers. Sound clips of the women talking about the episode can also be layered in. Alternate Version: Visitors can just flip through channels of the various shows written by female writers, with captions saying the show/episode name and the writer’s name. Interaction 3 – Phone: The rotary phone was still a major vessel for communication during this time. Visitors can pick up a phone and depending on the button they press, they can hear the story of a different lady comedy writer talking about her experiences during that period of time and throughout their journey. On the wall above will be images of these women, photos from the time, which refer to which number they can be reached at on the phone in a small caption. *The important takeaway from this section is that the visitors learn about the content that the women wrote and the stories that surround them. Another possible way to display this content and illuminate the wall is through projection mapping (see below for more ideas on that option). *These are possible technical ways to relay the content laid out above. None of these are set in stone. 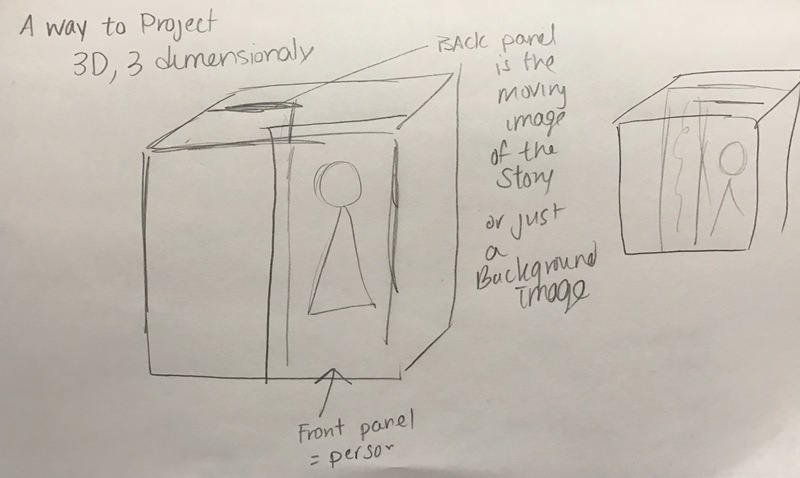 I can either hollow out the television and back project into it, or I can use the actual screen of the television to show the interactive content. *This are alternative ways that are optional for displaying content. 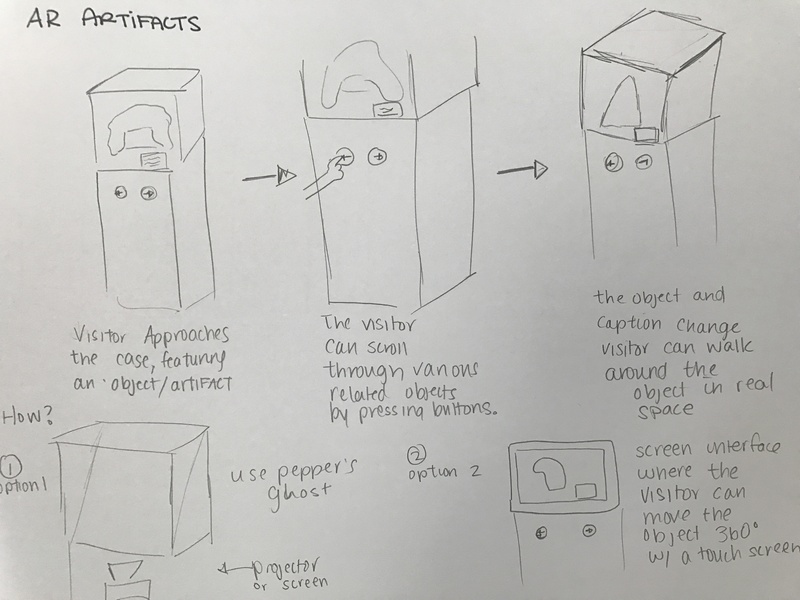 Instead of having physical objects, magazines, newspaper clippings, I can find a way to pack content into small spaces by 3D scanning them or by projecting 3D style images of artifacts, allowing visitors to scan through them. Another way to work this is to embed a display case into the wall, where visitors have to look into, the wall and framed, not necessarily out front of the exhibit on a podium.